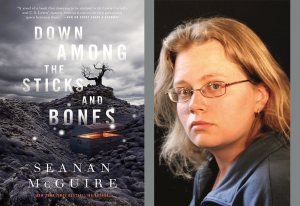 Fantasy writer Seanan McGuire, author of Down Among the Sticks and Bones (Tor Books), will be joining an exceptional panel at this year’s Literary Tastes breakfast and book signing at ALA’s Annual Conference in New Orleans. In the book, twin sisters Jack and Jill discover a portal that leads them to the Moors, a dark and unsettling world that reveals their true selves. Selected as this year’s Reading List Fantasy category winner, Down Among the Sticks and Bones will thrill both adults and young adults. The Book of Lost Things by John Connolly, The Magicians by Lev Grossman and Birthright by Joshua Williamson (graphic novels). Seanan is the author of the October Daye urban fantasies, the InCryptid urban fantasies, and several other works both stand-alone and in trilogies or duologies. In case that wasn’t enough, she also writes under the pseudonym “Mira Grant.” For details on her work as Mira, check out MiraGrant.com. Seanan was the winner of the 2010 John W. Campbell Award for Best New Writer, and her novel Feed (as Mira Grant) was named as one of Publishers Weekly‘s Best Books of 2010. In 2013 she became the first person ever to appear five times on the same Hugo Ballot. McGuire joins authors Kathleen Rooney (Lillian Boxfish Takes a Walk), Thi Bui (The Best We Could Do), narrator Scott Brick (Dead Wake) and Alyssa Cole (An Extraordinary Union) on the panel to discuss their writing (or performance) process, story line development and inspirations. The panel features authors and narrators that have been named to one (and sometimes more) of RUSA’s Best of Lists for fiction, nonfiction, poetry and audiobook narration in 2018.